A senior leader from Al-Nusra Front, Al-Qaeda’s branch in Syria, has been reportedly killed alongside two other members of the terrorist group in the province of Aleppo. Sanafi Al-Nasr, who was allegedly killed in an airstrike near the town of Dana, was Al-Qaeda’s senior strategist and an important power broker, the Iranian Fars news agency reports, citing jihadist sources close to the killed militant leader. Al-Nusra released several photos showing a car hit by an air strike along with several bodies of the dead militants, although their identities were not verified. However, jihadists claimed on social media that Al-Nasr had been killed. Other photos published by the terrorist organization show the alleged graves of Al-Nasr and two other militants who were killed in an airstrike. The death of Sanafi Al-Nasr, whose real name was Abdul Mohsen Abdallah Ibrahim Al-Charekh, was also confirmed by the Britain-based Syrian Observatory for Human Rights, who claimed the jihadist leader was killed on Thursday. Al-Nasr, who was born in Saudi Arabia, was a member of Al-Qaeda’s so-called “Victory Committee” that was responsible for developing and implementing the group’s strategy and policies. The jihadists did not specify if he was killed in a Russian airstrike or in an attack carried out by the US-led coalition. Some militants claimed on social media, it was a ‘Crusader coalition’ that delivered the strike. Russian warplanes have been hitting militants’ positions near Aleppo for several days. 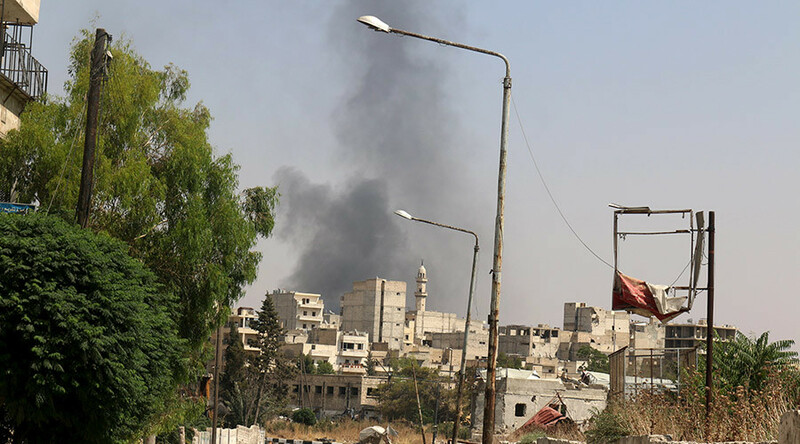 On Thursday, they targeted a total of 32 militant positions in several provinces including Aleppo, the Russian defense Ministry spokesman, Igor Konashenkov said. On Saturday, Russian planes struck 49 jihadists’ targets in the provinces of Idlib, Hama, Latakia, Damascus, and Aleppo. “As a result of airstrikes, 11 command centers and control posts of the militants have been destroyed,” Konashenkov said. An explosives workshop, three artillery positions, nine ammunition depots, two military equipment bases and 15 terrorist camps were also hit during the latest strikes, the ministry said. The US-led coalition also conducted three airstrikes in Syria near Aleppo on Thursday targeting tactical units and an explosive device cluster, Reuters reports citing the coalition’s statement. The Syrian army and Hezbollah fighters have started a major operation in the Aleppo province with Russia’s air support. They have already recaptured several villages and towns in the province.